Easy recipe for this one pot meal. Lean Ground Pork or Beef - 1 lb. 1) Brown beef, onion and garlic over medium heat until no pink remains. Drain any fat. Stir in tomatoes (including juice), tomato paste, Garlicky Italian Seasoning and tomato sauce. Simmer uncovered about 10 minutes. 2) Remove from heat and add rice. 3) Meanwhile, coarsely chop cabbage, rinse and shake dry. Heat 1 tablespoon of oil in a skillet and add 1/2 of the cabbage. Cook just until softened (about 5 minutes). Repeat with remaining cabbage. 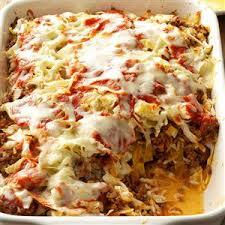 4) Place 1/2 cabbage in large casserole dish. Top with 1/2 meat, repeat. Cover with foil. 5)Bake @ 375F for 45 minutes. 6) Mix cheese, egg, milk. 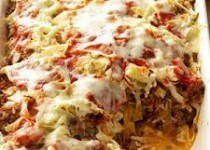 Top casserole and bake no foil an additional 20 minutes.